Carbohydrates are sugars in the food you eat that your body turns into glucose for energy. Think of carbohydrates as simple, such as in sweeteners added to processed foods, or complex, such as starches and fiber. Complex carbs are the "good carbs," says the Centers for Disease Control and Prevention. You'll find complex carbohydrates in vegetables, including mushrooms. 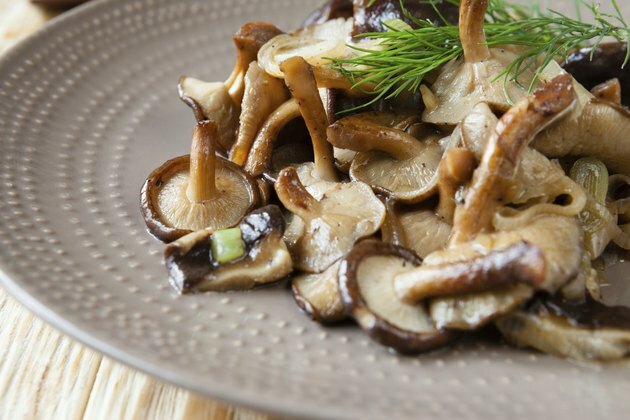 Mushrooms are a low-carbohydrate food. One cup of whole, white mushrooms contains 3.1 grams of carbohydrate. It's also one serving of vegetables closer to the 3.5 cups you should eat daily, according to the American Diabetes Association. A typical serving of nonstarchy vegetables, such as mushrooms, broccoli or asparagus, contains about 5 grams of carbohydrate per serving.